In Greek mythology, writers would tell of four second generation Titan brothers, the four sons of Iapetus and Clymene. These four brothers were Atlas, Menoetius, Prometheus and Epimetheus. 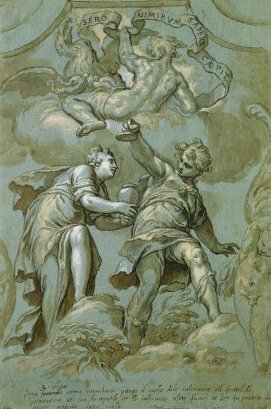 Atlas would become famous when he was punished by Zeus to hold up the heavens, whilst Prometheus would become famous when he was punished when he acted as the “benefactor of man”. Epimetheus though was not directly punished by Zeus, and so this is perhaps the reason why he is not as well known as Atlas and Prometheus. Despite this lack of fame though, Epimetheus though did have a vital role in the creation of mankind. In the timeline of Greek mythology, the name of Epimetheus becomes important during the Titanomachy, the ten year war between the Titans and Zeus. This neutrality meant that after the war, which of course Zeus one, Epimetheus and Prometheus were not punished like the other Titans. Indeed, after the war, Zeus would give Epimetheus and his brother an important job. Zeus wished to populate the earth with animals and man, man being particularly important for it would be they who worshipped, and made sacrifices to the gods. Man and beast were crafted from clay, and then Epimetheus and Prometheus were given the responsibility of allocating skills and characteristics crafted by other gods amongst the normally created life forms. Epimetheus would willingly take up the primary role of distributing the skills, whilst Prometheus would check on his brother’s work, before releasing the finished creatures into the world. Epimetheus would ensure that no creature went unequipped, and whilst some creatures were given the skills of the predator, others were given quickness, burrowing skills or flight to help avoid the predators. Epimetheus’ name though means Afterthought, and the Titan had not planned ahead, for when it came to providing skills and characteristics for man, Epimetheus found that he had none left. Zeus would not provide more attributes, and was willing to simple have man go unprotected into the world, Prometheus though had other ideas, and so the brother of Epimetheus went amongst the workshops of the other gods and stole skills that he could give to man. These skills would include elements of wisdom stolen from Athena. Man therefore went into the world with the skills needed to survive. The theft of these skills though would be the first misdemeanour of Prometheus, and eventually, when the misdemeanours added up, the Titan would be punished by Zeus. Before Prometheus was taken away and tied to a mountain, he warned Epimetheus against accepting any gifts from Zeus or his kin. Epimetheus though had not angered Zeus, unlike Prometheus, and so the Titan remained free and lived quite happily amongst the other Greek gods and goddesses. Zeus though had been angered by the actions of man, who had been assisted by Prometheus, and Epimetheus was drawn indirectly into this punishment. 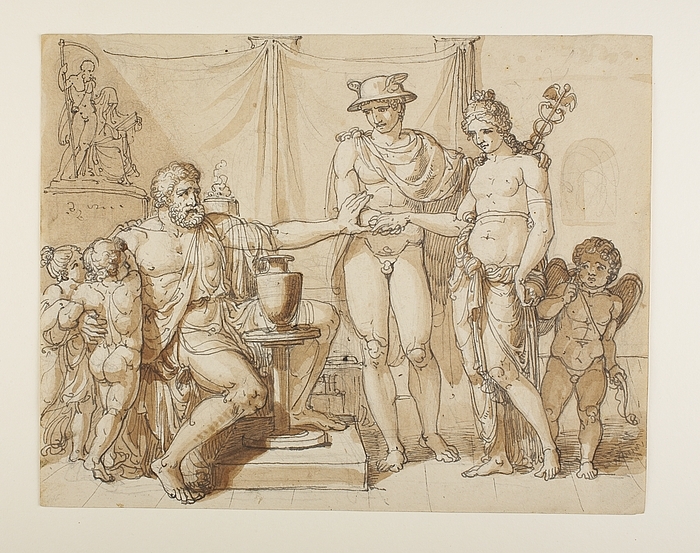 Hephaestus was ordered to manufacture a woman out of metal, and when this woman had life breathed into her by Zeus, she was presented to Epimetheus to be his wife. Epimetheus willingly accepted this beautiful woman as his wife, forgetting all about the warning given to him by Prometheus. This woman though, was no ordinary woman, for she was Pandora, and it was Pandora’s curiosity that saw hardship and evil released into the world. The gift of Pandora may not have been of benefit to man, but Epimetheus and Pandora lived happily together as man and wife. The relationship would bring forth a daughter named Pyrrha. Pyrrha would become famous in Greek mythology, as in some tales she is one of only two mortals, alongside her husband Deucalion, who survived the great flood sent by Zeus to wipe out man.